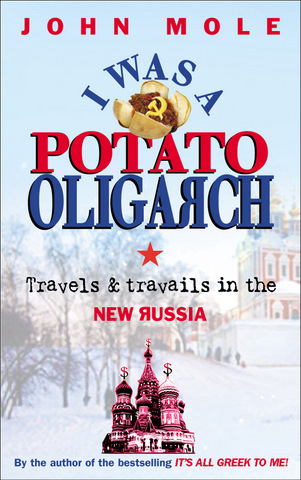 John Mole’s book, ‘I was a Potato Oligarch’, is described in the blurb as ‘eye-wateringly funny and always entertaining’ and having read it from cover to cover, I can vouch for the fact that this summary is entirely accurate. It is categorised by genre as travel narrative and business, but I think it would be equally at home in the comedy section of any decent bookshop. I spent a few weeks reading the book on and off, covering a lot of ground on buses, trains and aeroplanes and appropriately, turning the last page in a coffee shop in St Petersburg. I have learnt in the last few years that there is nothing to be gained in hiding your emotions about a book when reading in public, and when reading Mole’s account of his ‘travels and travails in the new Russia’ I shamelessly laughed out loud more than just a few times. Mole goes to Russia soon after the collapse of the Soviet Union and sets out to start a business in baked potatoes there. His book recounts the ups and downs of the quest to find the best year-round potatoes, convince the Russians that there really is something in his plans and ultimately, find his fortune in the spuds on post-Soviet soil. Mole is from a business background which is evident throughout the book and if I’m honest, much of the business jargon and many of the references and explanations went over my head. I’m sure that for those with a business brain would find this aspect fascinating, though. Instead, what caught my attention was the humorous angle Mole views his time in Russia from – while enviably ambitious and persevering with his plans, he is also light-hearted and seems to take Russia with an ever-optimistic spin. He throws himself into the lifestyle and the way business seems to be done, embraces every opportunity that comes in his way and is rewarded for his audacity by, more than once, finding himself in just the right place at just the right time to be able to re-tell some, frankly hilarious stories. The pages are packed with side-splitting recounts of encounters ‘on the ground’ of Russian life and business, but my favourite episode is when Mole unwittingly finds himself participating in a pro-Yeltsin demonstration in Red Square. As he is standing in the heaving crowd, a frantic woman in a ski jacket bustles through, desperately seeking someone who speaks English. Mole steps forward and in the process, inadvertently offers himself to give an authentic Russian perspective on the day’s events in Moscow to the BBC. British through and through, he is thrust in front of a television camera and interviewed, the TV crew just assuming he is Russian. As you read the book, you become gradually less surprised at the way Mole reacts in these types of situations and by this point what he does now does not surprise you too much – obviously he simply pretends to be Russian and offers a unique viewpoint on the events in an immaculate local accent to the TV crew and their recording camera! The book is happily littered with these types of little anecdotes which you really couldn’t make up. Mole has a lovely knack of making the improbable seem a normality, which is one of the things that I think, make the book such an absorbing read. Everyone, at one point in their life or another, finds themselves in an utterly surreal situation and for me in my life, many of these situations have happened in Russia. However bizarre the situations may be though, after a while you learn not to ask questions and just to embrace the moment, which is exactly what Mole does and I think, one of the reasons I loved reading his book so much. His incredibly casual way of falling into these amusing situations demonstrates his overall attitude to Russia and life there – that it needs to be taken with a pinch of salt and, simply enjoyed and relished. I felt a little bit of disappointment when I turned the last page of the book – I wanted the series of hilarious events to continue indefinitely, partly because it was a pleasant way to pass the time, but mainly because I can relate to the way Mole ‘takes’ Russia. Russia is to be loved, embraced and cherished, whatever situation you find yourself in. So love, embrace and cherish it, then use your memories, like Mole has done perfectly, to help others to imagine Russia and all that is surreal that lies within.